Home » Recipes & Videos » May Painting Swap! The May Swap is open for sign ups until April 30th, 2019. Once signed up you will be directed to a quick questionnaire to help us pair you with the perfect painting buddy. Then it’s time for us to get to work partnering you with the perfect swap partner. After the swap, each participant is invited to share what they have received/exchanged on our community page for all to enjoy. While waiting for your swap partners information, you can start to gather your materials and consider the style of painting you will make for your partner. Swap partner information will be emailed by May 1st, 2019. It is encouraged that you reach out to your partner after receiving their information to find out more “fun facts” about them. All paintings are to be mailed by May 31st 2019. 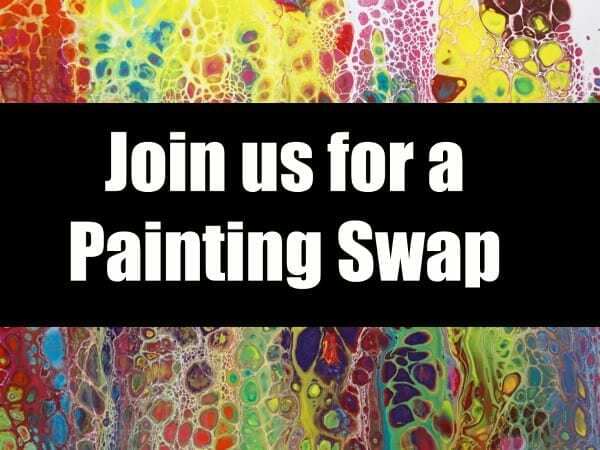 We welcome you to join our Facebook group where you can upload pictures, ask questions and meet other members, you can also share your work over on Instagram- we’ll be using the hashtag #acrylicpouring. You can follow us on Instagram here. Hi. I’m in the UK do you have other swappers here? Hey Lynette, in the past we’ve usually had a few swappers from the UK so we should be able to match you with someone there! What is the $5.00 fee for? What does it go towards? Thank you. Hi Lisa, the $5 fee goes to acrylicpouring.com to pay for administering the swap. But the main reason we charge the fee is when we used to do it for free a lot of people would end up not sending paintings to their partners. The $5 helps people to feel committed. Thanks for asking! I’m in Nigeria. Will I get a swap partner here? Totally interested in this. Hey Ayee, we’ll try to match you with someone as close as possible to you. Right now we have someone signed up in Saudi Arabia who is probably the closest to your location. Currently no one’s signed up in Nigeria though, so if shipping to another country is a problem then we may not have the right partner for you.